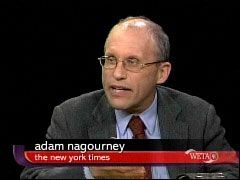 Reporter Adam Nagourney nodded along to the Democratic-friendly idea that "centrist" Democratic Sen. Evan Bayh's retirement was about "unyielding partisanship" in Congress, not the grim prospects for the party in 2010. The headline at least summed things up accurately: "Democrats Reel As Senator Says No to 3rd Term." But reporter Nagourney nodded along with Bayh's boilerplate about how current Washington politics had become dysfunctional. Text box: "A senator bemoans an increase in partisanship." Senator Evan Bayh of Indiana announced on Monday that he would not seek re-election, sending a wave of distress over his fellow Democrats and focusing new attention on the view that unyielding partisanship had left Congress all but paralyzed. "For some time, I have had a growing conviction that Congress is not operating as it should," Mr. Bayh said. "There is too much partisanship and not enough progress - too much narrow ideology and not enough practical problem-solving. Even at a time of enormous challenge, the people's business is not being done." Mr. Bayh's decision staggered Democrats. It was the latest in a series of setbacks that illustrate just how far the party's fortunes have fallen since President Obama came to office more than a year ago, sweeping big majorities into the House and Senate with him. Mr. Bayh stepped aside despite personal entreaties from Mr. Obama and his chief of staff, Rahm Emanuel, White House officials said. A January 25 Rasmussen poll showed Bayh losing to Republican Congressman Mike Pence, 44% to 47%. While Pence has since decided against running, the poll also showed former Republican Congressman John Stutzman, who has formerly announced his candidacy, getting close at 41% to Bayh's 44%. Numbers like that certainly do not suggest Bayh's reelection was anywhere close to being "a lock." It's strange for Nagourney to insist the GOP is "still facing long odds in their effort to win a majority," given that a Republican takeover of the Senate would have been considered impossible just four months ago. What was most striking about Mr. Bayh's announcement was the deep disillusionment he expressed with his place of employment, a feeling reflected in recent polls. In a New York Times/CBS News poll last week, 75 percent of respondents said they disapproved of the job Congress was doing; just 8 percent said members of Congress deserved re-election. Mr. Bayh pointed to the partisan standoff over efforts to create a commission to address the mounting national debt. Republicans blocked an effort pushed by Mr. Obama to create a bipartisan commission by legislation, with seven Republicans who had co-sponsored such an approach announcing they would vote against it. "This is colored by having observed the Senate in my father's day," Mr. Bayh said. "It wasn't perfect; they had politics back then, too. But there was much more friendship across the aisles, and there was a greater willingness to put politics aside for the welfare of the country. I just don't see that now." A Times headline writer followed Nagourney and the rest of the media in misleadingly calling Bayh a "centrist" in a jump-page headline: "Democrats Reel as Centrist Senator Says No to a 3rd Term." Bayh, while not as liberal as many of his colleagues, is certainly no "centrist": His American Conservative Union rating is 21 out of a possible 100.